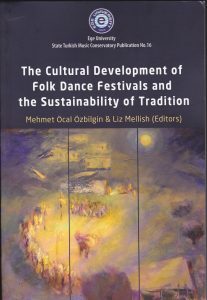 The ‘Cultural Development of Folk Dance Festivals and the Sustainability of Tradition’ is a collection of case studies written by authors who have undertaken long term research on folk dance festivals, in many different locations, as part of their overall research as dance ethnologists, ethnochoreologists or anthropologists. All the authors in this book are concerned with the sustainability of the dance genres they research and have identified folk dance festivals as an important space for the performance, transmission, transition and transformation of folk dances. The chapters included follow the historical development of folk dance festivals as well as investigating reasons for the major changes the authors have observed in folk festivals and folk dance activities over an extended period of time. Özbilgin, Mehmet Öcal and Mellish, Liz (editors) (2018). The Cultural development of folk dance festivals and the sustainability of tradition. İzmir, Turkey: Ege University Press. ISBN: 978-605-338-238-6. 30th September 2018 | Category: Books, Publications by Nick. 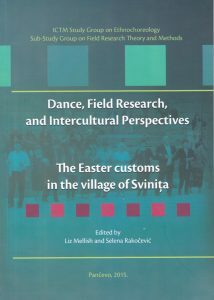 Dance, Field Research, and Intercultural Perspectives, edited by Selena Rakočević and Liz Mellish, is a result of joint field research carried out by members of the Sub-Study Group on Field Research Theory and Methods in the village of Svinita, Romania in May 2013. The field research and subsequent book wasbased on Easter customs and the hora de pomană. This was the last field trip of our colleague Anca Giuchescu, and the volume is dedicated to her. There is also a significant article by Anca in the volume, which summarizes some of her field experiences and knowledge of Romanian village dances. Of special significance is that the membership of the Study Group danced the hora de pomană at the symposium in Graz in memory of Anca. Rakočević, Selena; Mellish, Liz (editors) (2016). Dance, field research and intercultural perspectives: The Easter customs in the village of Svinița. Pančevo: Selena Rakočević, Kulturi centar Pančevo. ISBN 978–86–918261–1–6. 30th June 2016 | Category: Books, Publications by Nick. grouped under the three themes of the Symposium: Improvisation in music and dance of Southeastern Europe, Professionalization of music and dance in Southeastern Europe, and inter/postdisciplinarity in ethnomusicology and ethnochoreology. The fourth symposium was dedicated to the work of Danica and Ljubica Jankovic, pioneers of dance research in Serbia. The year 2014 marked multiple anniversaries connected with the lives and work of the Jankovic sisters; 80 years since publishing their ﬁrst book, 50 years since publishing eight volumes of Folk Dances, 120 years since Ljubica Jankovic’s birth, 40 years since her death, and ﬁnally, 40 years since Ljubica, as a dance scholar, was proclaimed a member of the Serbian Academy of Science and Art. The guest of honour was Olivera Vasic (1946–2015) whose work continued the work of the Jankovic sisters both in the domain of recording folk dances and the continuity of ethnochoreology in Serbian academia. Mellish, Liz; Green, Nick; Zakić, Mirjana (editors) (2016). 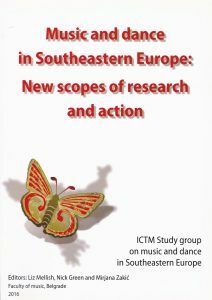 Music and dance in Southeastern Europe : new scopes of research and action, Fourth symposium of the ICTM Study group on music and dance in Southeastern Europe. Belgrade: Faculty of music. ISBN 978–86–88619–71–4. 31st May 2016 | Category: Books, Publications by Nick. Dunin, Elsie Ivancich; Mellish, Liz; Opetcheska-Tatarchevska, Ivona (editors) (2014). 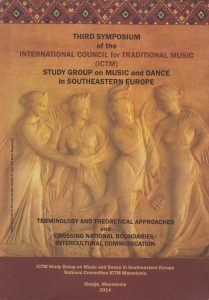 Third Symposium of the International Council for Traditional Music (ICTM) Study Group on Music and Dance in Southeastern Europe: Terminology and Theoretical Approaches and Crossing National Boundaries / Intercultural Communication.Skopje, Macedonia: International Council for Traditional Music National Committee Macedonia. ISBN 978–608–65721–0–5. 30th April 2014 | Category: Books, Publications by Nick.